In the 19th century papers, house agents advertised sales with full details of contents. These advertisements show us the furniture fashions of the time, and also give an idea of the size of the houses. Often when moving to the mainland, all furniture was sold, rather than paying to have it shipped across the water. Beachlands sale notice August 1892. House sales in The Strand, Ryde. In the account of the Isle of Wight Horticultural Show, held in the grounds of Sir Augustus Clifford, bart., at Westfield, which we gave a few weeks ago, a passing allusion was made to the new gallery of art recently erected at that marine residence. Since that account appeared, Sir Augustus has kindly shewn us the gallery and its contents, a short description of which may, perhaps, be very interesting to our readers. The gallery is built at the south-west portion of the residence, overlooking a beautiful lawn studded with fine specimens of sculpture, with a background of luxuriant foliage. The interior is finished with Corinthian pilasters, supporting an enriched cornice, from which springs a segmental ceiling, divided into compartments (corresponding with the divisions formed by the pilasters) and these are again subdivided by enriched coffered pannels, supporting a skylight, through which the principal light to the gallery is admitted. The glass in the ceiling is of ornamental design, and emblematical of Art, Literature and Music, and has a very pleasing effect. The room, from the variety in the plan, has a striking and unusual character, which is much enhanced by the semicircular tribune with the Apollo Belvidere, at the south end, over which is a medallion of Sir Augustus faithfully and excellently executed by Mr Grey, the sculptor, of Ryde; and the anteroom, with the Apollino, at the north end. This latter portion receives its light through a skylight of ornamental glass resembling the signs of the zodiac. The decorations of the room are very effective; the walls being hung with a deep blue paper, diapered with black, divided by large gold moulding of the cable pattern into pannels, with stiles formed of a gold-coloured paper. The paper is continued round the whole of the tribune and in the anteroom. The ceiling is grey and white, relieved by gilding. The whole gallery, with its beautiful variety of works of art, consisting of pictures, statues, vases, bronzes, with the elegant mahogany bookcases, form a completeness indicative of the most refined taste; at the same time utility has not been sacrificed, as we have never been in any gallery – large or small – where the light is so well diffused over the objects as in this. The designs were by Mr Thomas Hellyer, architect, of Melville-street, Ryde, and the building and all its architectural decorations were completed by Messrs DASHWOOD, of Ryde, to all of whom the greatest credit is due for the masterly manner in which it is carried out. The gateway of Westfield House was built in 1860, by Thomas Dashwood. 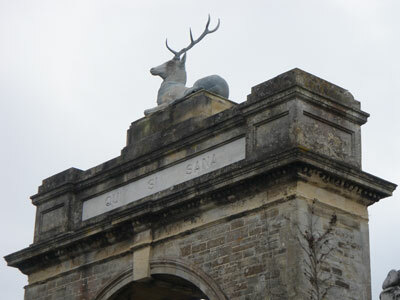 On the side facing the road is the motto of the King of Italy’s Villa at Castel-a-Mare – ‘Qui si Sana’. On the reverse, was the following inscription – ‘In memoria, d’una Famiglia Illustrissima che trovo Qui Calmae Piscere, nel mese di Settembre, dell anno 1860.’The bronze stag was exhibited at the Great Exhibition of 1851, and was a particular favourite of Prince Albert. To read more, please go to the Queen’s visit to Ryde, 1864.